The platform – the first new Electronic Patient Record for the NHS in twenty years – exploits modern mobile technology to give clinical and operational teams in acute settings the real-time information they need to deliver safer, faster, high quality care. Nervecentre’s Next Generation Electronic Patient Record (EPR) has been designed with – and for – clinicians to support hospitals as they tackle their most resonant challenges; patient safety and patient flow. It provides mobile tools to help trusts build a culture of real-time data entry by putting the EPR into clinicians’ pockets and ready to use at the patient’s bedside. Evidence shows that the real-time visibility unlocked by mobile solutions can have a significant impact on hospitals’ ability to recognise patient deterioration, escalate care and improve flow. However, Nervecentre Founder and CEO Paul Volkaerts says trusts may need to consider more agile EPR deployment strategies if they’re to expedite the clinical benefits of mobile innovation. The new EPR augments Nervecentre’s well-established clinical workflow solutions with the addition of new tools to help integrate and accelerate pathways. 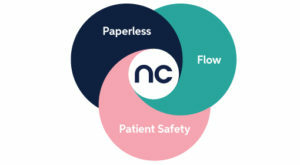 The solutions, which can play a major role in the drive for paperless care, free clinicians to spend more time with patients, empowering them to make safer decisions quicker and improving the fluidity and agility of acute care. The new functionality integrates seamlessly with – and complements – pre-existing Nervecentre tools; eObservations, Clinical Noting/eHandover, ED, PAS, sepsis screening, Patient Flow/Bed Management, Risk Assessments, Referrals, clinical workflow and digital photography. Unlike traditional EPRs, the entire Nervecentre suite has been developed and designed in the mobile era, enabling hospital teams to capture and access real-time information at the bedside via fast, intuitive, clinically-focused user interfaces. Nervecentre 5.0 provides 21st Century tools for a 21st Century NHS. Unveiling the EPR at the iconic London Science Museum, Paul Volkaerts said that a pressurised NHS not only needed Next Generation EPR to address its modern-day challenges – it also needed a ‘Next Generation approach’ to digital transformation to ensure the advantages of modern technology are quickly realised where they matter most: on the front line of patient care. “Conventional wisdom dictates that an EPR strategy starts with replacing all key administrative systems; PAS, outpatients, theatres and order comms. But the ‘PAS-first’ approach is complex and expensive. It often costs millions of pounds, takes years to implement and offers more pain than gain to clinical and operational teams. The clinical benefits can take as much as five years to materialise.